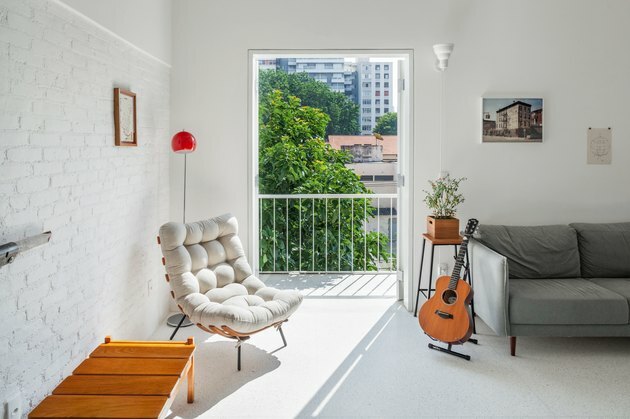 Pinheiros is one of Sao Paulo's most bustling neighborhoods, so when the architectural team at Vão Arquitetura was tasked with overhauling a second-floor apartment, they sought to create a home that matched the area's upbeat creative scene, but still provided tranquility. 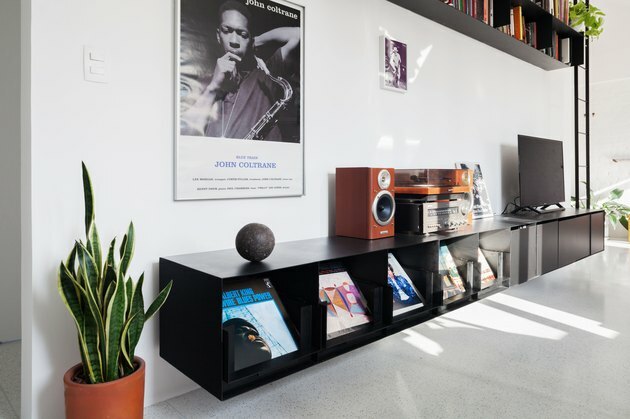 The firm collaborated with the client to create a space for his hobbies, which include art, playing guitar, and collecting LPs. With only 538-square-feet to work with, custom storage units became the focus of the design. 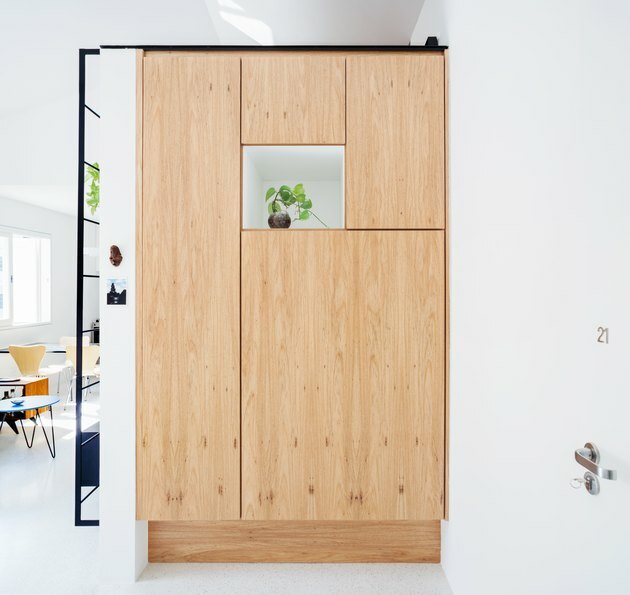 And instead of knocking down walls — which is often the go-to in trying to open up an already small space — the firm actually extended one wall to create more privacy. The result? A cozy, character-filled apartment that offers serene garden views. Bars, boutiques, and public transportation stops define the neighborhood, which is a residential-commercial mix. The spaces of the apartment were divided to create private and shared spaces and there are both bustling city and garden views (on the other side). 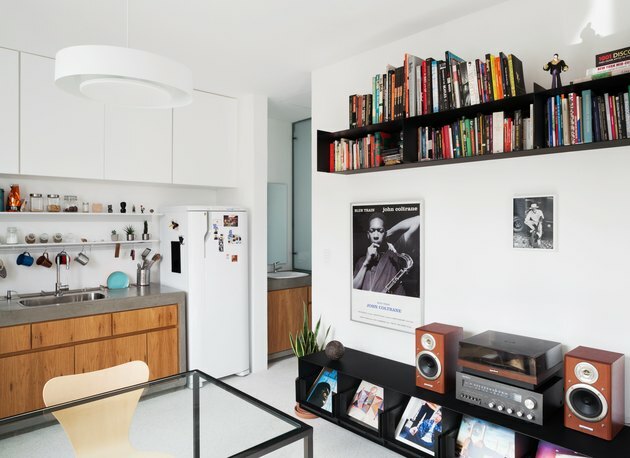 Most of the furnishings in the apartment, including the cabinets, were designed by the architectural firm, and made from medium-density fiberboard (MDF). The MDF is covered by Freijó, a type of wood popular in Brazil. 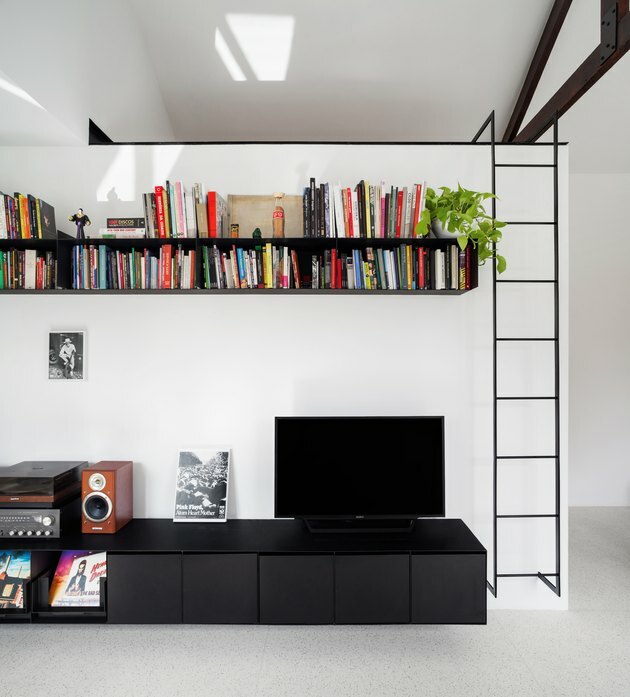 An iron ladder, over 10 feet high, leads to a collection of books and LPs. The firm was able to utilize the upper level to create more space for the client's artistic passions. 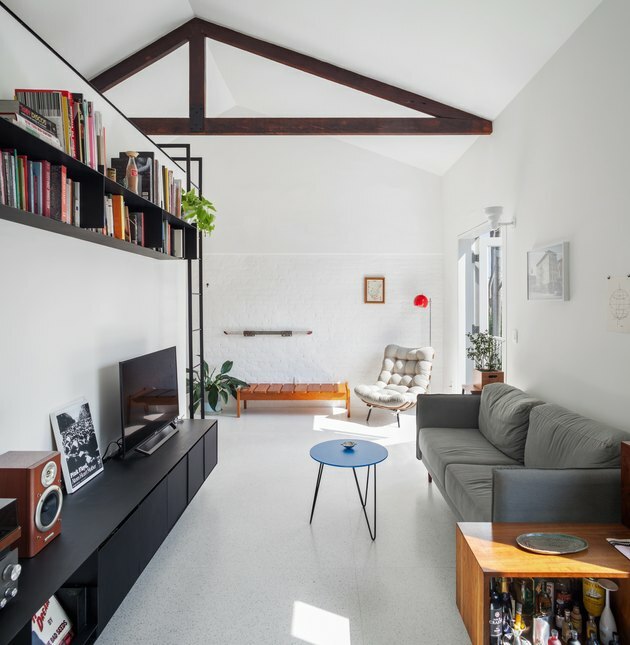 By not demolishing any of the existing structure, the team was able to leave original elements, such as the wood ceiling beams. The floors were made from a mixture of marble, granite, sand, cement, and water. Clever modular storage units were custom-designed by the team. 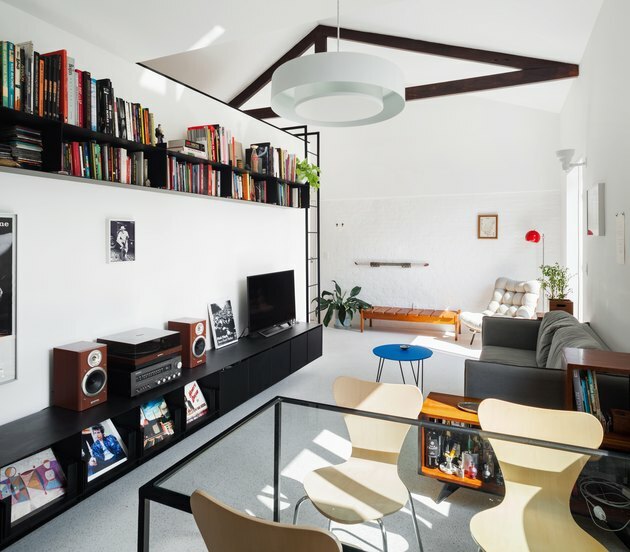 The color palette in the apartment is uncomplicated, relying on white and black contrasts and organic wood elements. Originally, this space was a laundry area, but because the apartment building already has a shared laundry room, the firm wiped it out to allow for more space and storage. Natural materials meet industrial elements in the kitchen. Kitchen cabinets, also made from MDF covered in Freijó, are encapsulated by a cement border. 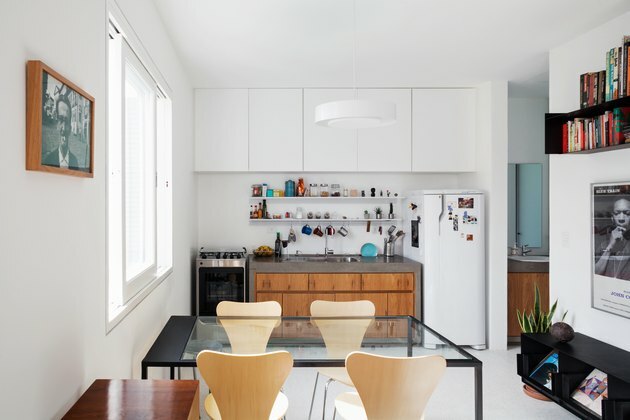 The open kitchen is just large enough to accommodate a dining area. 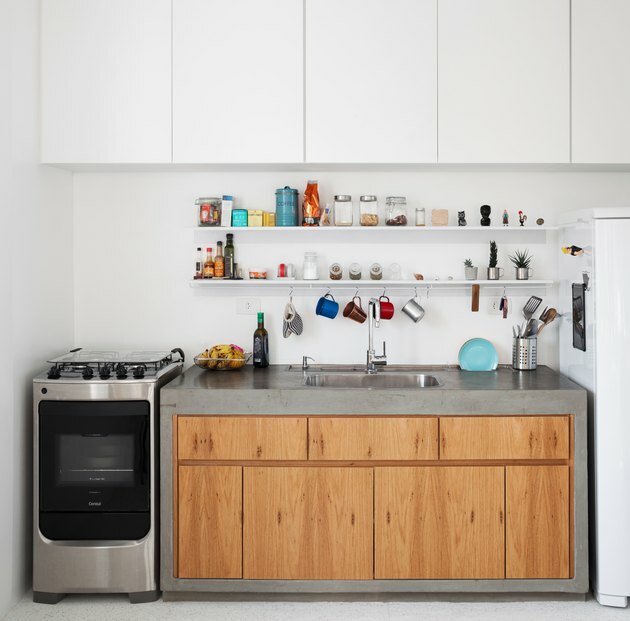 The kitchen features a mix of open shelving and custom cabinetry. After interning at Dwell magazine in San Francisco, Kate began writing about arts, design and culture for other national publications. She is based in Los Angeles and San Francisco.